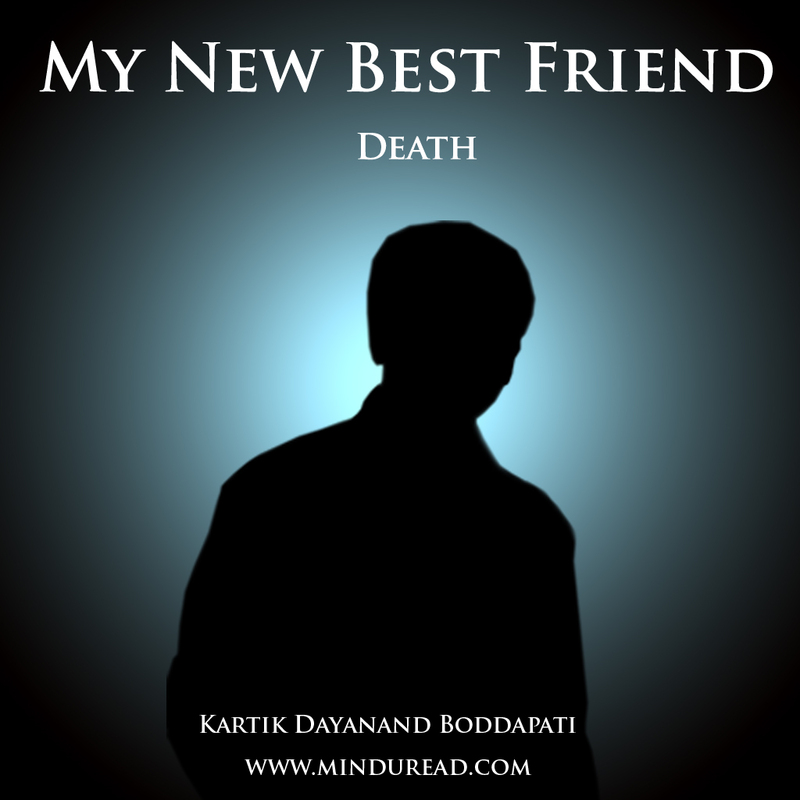 Death: My new best friend! Death, the one word we all shudder to think about, the one word that shakes us up more than any other word. More so when we lose someone close to us or think we are going to come face to face with it. It is an event that is certain to grace us, whether we like it or not, it’s like an uninvited guest that we need to entertain. Generally unless something like the Mangalore Plane crash happens we never bother to talk about death. Even then we talk only about the event, never about death itself. How many people dead? How did they die? What could have happened if so and so happened? Who broke which story first, etc, etc? But today, i wish to talk about death itself, not about how or why it happened. There are many ways one can die. Some methods are well known to us and some extremely bizarre, all leading to one thing, death. Have we ever wondered what death is exactly? How does one say that so and so person is dead? Just because someone’s heart stops beating we consider them dead. The moment heart stops beating there is no supply of blood so every other organ in the body ceases to work which jams the mechanism of the human body leading to a total breakdown. In clinical terms this is death, malfunctioning or total breakdown of the human body. I doubt if this is an apt way to describe death. There are ways in which we can make all these organs function artificially yet we will not be able to get the person back to LIFE. So what is death and how is it linked to life? It is true; there can be no death when there is no life. Just like there can be no bad if there is no good. It is the balance of this world, life and death. A balance that is sometimes very uneven and unjust. We continue living as long as we have life whether we treasure it or loath it. We are all the time concerned about our lives. We tend to celebrate life and mourn death. Both are an essential part of our existence. I often wonder why we cannot embrace death too with the same enthusiasm as we embrace life. Why are we scared of death? After all in god’s scheme of things, life is only a blip and we spend an eternity in the ether compared to time on earth. Shouldn’t we then be prepared to face the world that is beyond our understanding rather than ignoring the fact that death is our best friend and is sure to come knocking at our door soon. Before i go on further i would like to classify death into certain categories so as to enable us to choose which one we want ultimately. This choosing is only for our comfort, when the actual event happens we are not the choosers but the chosen ones. Every single death that occurs in this world is a death by design. Be it the design of Man or Nature. Human kind is known to have created the most amount of designs to inflict death upon others. Be it going to war, terrorism, naxalism, murders, suicide bombings, accidents, genocide, infanticide, etc, etc. We have designed them all. On the other hand Nature has its way with natural calamities like Earthquakes, Tsunamis, Cyclones, Volcanoes, Storms, Fire, Disease, Epidemics, etc, etc. Both man and nature are adept at designing death. If they are the givers then we also have different types of receivers. Broadly there are two kinds, the ones who encounter death by chance and the ones who encounter death by purpose. Chance and luck are two words that are often used to describe the fate of the survivors of any major accident. The chances of knowing in advance if one is going to die in an accident is almost zero. In fact the very fact that most accidents happen is because of the chance factor in life. We die by chance, it’s never intended. Just like the plane crash in Mangalore yesterday or countless other accidents we hear of every day. None of it is planned by us, it just happens by chance. Same is the case with diseases like Heart attacks, Cancer, Aids, etc. Can we do anything about it? I doubt it, at the maximum we can only take precautions by following certain rules, rest is just a big chance. You never know when your luck is going to run out. The other kind of death is a death by purpose. Ask any soldier enrolled in the army or police force fighting for the country. They know death is a possibility in their line of work and are more or less prepared to die fighting the enemy. It’s a noble cause. They are fighting for their country. At the same time it might not always be for a noble cause. There is another variant of this category. If the above mentioned people are brave people then this breed is the opposite of that. It is the meek who find solace in the fact that terrorism is the only solution to life’s problems. A suicide bomber or an assassin is equally filled with purpose of taking not only others lives but his own life too, most certainly they lead a purposeless life. The other kind of suicide is the case where one takes his life out willingly. Reason could be a failed love story, loss of crops, loss in business, etc. This is the most hopeless of deaths because the person is already dead before he decides to kill oneself. What use of death when life itself is purposeless. How can you kill someone when he already doesn’t have a life? It’s better to go get a life and then death will automatically seek you when you least expect it. Now that we know the kinds of death’s available to us, let’s choose which one we would want to have. Haha, are you wondering if i am joking. No, am not. It might sound like a joke to you when i say “choose your death”. But fact is we are absolutely clueless about this matter and would never want to talk about this. Death is never difficult for the one dying, but it is the biggest pain for the people around that person; especially the ones who love that person and depend on him for their life. Do you see the connection between life and death once again? Make no mistake, be it an infant, child, teenager, middle aged person or a senior citizen. There is a purpose for every being on this earth and their death will alter the life path and destinies of many numbers of people around them. When we know this fact why do we tend to ignore and not talk about death? The maximum we do is buying some life insurance, in most cases we do it solely for the purpose of tax saving without really giving it a serious thought. We plan for every small detail in our lives, what kind of food we like, what kind of films we like, what kind of music we listen to, what kind of people we like to hang around with, etc, etc. Let’s pause for a moment and plan a little bit for our death. Let’s make it our best friend. Be prepared to face it and also prepare the ones around you to face it. About how to do it, i am not old enough or qualified to talk about it. Maybe our holy books Gita, Quran and Bible have some answers. But am certain about one thing, we sure will know the answers once we start speaking about it with our close ones. I have seen death in my family by losing my father at a young age. His death did alter the lives of the rest of our family. I only wish he spoke more about death before he died and prepared us to face what came our way next. I just wish, every time another disaster like the Mangalore Plane crash happens or when we hear of countless other accidents everyday, it need not come as a shock to any one of us.